Home » Dog Health » What Can I Catch from My Dog? Zoonotic Disease! Dogs can carry all kinds of bugs that are potentially contagious to people, often without obvious symptoms. Believe it or not, your cute, furry friend could be harboring thousands of disgusting parasites right now! Thankfully, the risk of your family contracting a zoonotic disease from your dog is low, as long as certain precautions are taken. You are much more likely to catch disease from other humans than you are from your dog, but it is always good to be aware of potential health risks for your family. A zoonosis is a disease that is transmissible between animals and humans. Certain people are at much higher risk for contracting zoonotic diseases from dogs. This includes the very young, the very old, pregnant women, and immunocompromised individuals, such as those infected with HIV or being treated for cancer. Zoonotic diseases are transmitted when a person comes into contact with contaminated body fluids or stool from an infected dog. 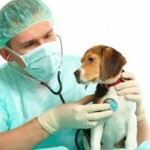 They may also be passed through contact with water, food or soil that has been contaminated by an infected dog. Let’s talk about some of the most common zoonotic diseases your dog can carry. The most notorious zoonotic disease is rabies. Rabies is spread through a bite from an infected animal. There is no cure for rabies, and once symptoms are exhibited, the disease is always fatal. 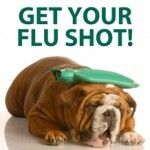 Prevention includes vaccination of all household cats, dogs, and ferrets. Vaccination is required by law in all 50 states, even for animals that are primarily indoors. Keeping your pet up to date will protect him in the event he bites another person, or in the case that a bat or other potentially rabid animal got into your home. The risk of catching intestinal parasites from your dog can be greatly reduced by the use of monthly heartworm preventatives that have additional ingredients to kill the most common types of parasites. Keep in mind that preventatives do not kill all the possible types of intestinal parasites, so checking a stool sample one to two times per year in addition to preventatives is recommended. 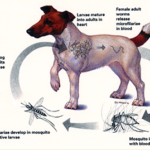 Flea-infested dogs may become infected with tapeworms from fleas ingested while grooming. They can also get tapeworms from eating infected rodents. Tapeworms do not usually cause clinical problems in dogs, but because of their zoonotic potential, they should be treated promptly. Children, albeit rarely, can become infected with tapeworms from inadvertently ingesting fleas. Roundworms and hookworms in dogs can cause diarrhea, vomiting, weight loss, anemia and death in severe cases. Roundworm infection in humans can cause organ damage, blindness, neurological dysfunction and other problems. Hookworm infection in humans can result in cutaneous larva migrans, an itchy skin condition caused by the parasites migrating through the skin. These parasites are contracted through the inadvertent ingestion of contaminated soil. Children are particularly at risk due to their higher likelihood of contact with contaminated soil during play. Proper hand hygiene, keeping your property free of pet waste, and cleaning soil from vegetables can prevent infection. Protozoans are single-celled organisms. 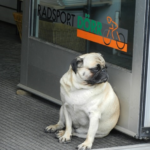 The most common protozoal diseases in dogs and humans are cryptosporidiosis, and giardiasis. Cryptosporidium and giardia can cause diarrhea in both dogs and people, who usually become infected by a common source—for example, contaminated water—not by each other. Preventative measures include good hygiene and boiling or filtering water for drinking use. Leptospirosis is a bacterial infection spread by wildlife, through their urine. Leptospirosis enters the body through skin or mucous membranes, after coming into contact with infected urine, soil, or water. Lepto can cause kidney and/or liver failure in dogs and in people To avoid contracting leptospirosis, control rodent infestations, and wash your hands well after coming into contact with your pet’s urine or feces. . A vaccine is available for dogs, and is recommended in endemic areas. People usually get salmonellosis by eating contaminated food, such as undercooked chicken or eggs. However, dogs and other animals—even those that appear healthy—can carry and pass salmonella bacteria in their stool. Salmonella bacteria are more commonly harbored by dogs that feed on raw meat or wild birds and animals. Canine infection can be prevented by feeding them cooked or commercially processed food. Human infection can be prevented by wearing gloves and washing hands thoroughly after picking up feces. Campylobacter infections can cause vomiting and diarrhea in humans and dogs. Most human cases of campylobacteriosis are caused by ingestion of improperly cooked poultry products. In people, symptoms usually resolve without treatment, but immunocompromised individuals can become seriously ill.
Staphylococcus aureus is a common bacterium on skin, and it is not usually a problem. However, when the Staphylococcus aureus bacteria are not susceptible to the antibiotic methicillin, it is referred to as methicillin-resistant. These bacteria are often resistant to other antibiotics as well. 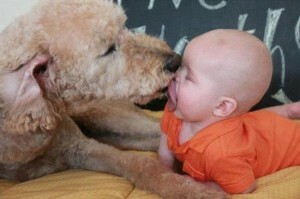 It can be transmitted by direct contact between people and dogs. It can also be spread by contact with contaminated bedding, bandages, blankets and other materials. MRSA can be carried on the skin or in the nasal passages of healthy people and/or pets. If an infection is present, it can be found almost anywhere—especially where there’s a skin wound or sore. Proper hygiene can help prevent the spread of MRSA between dogs and people. The scabies mite can cause extreme itchiness in both dogs and people. Scabies prefer to live on animals, so they generally do not live for a long time on humans. They are spread through direct contact with infected individuals. Practicing good hygiene can help prevent this mite from spreading to humans. Ringworm is not caused by a worm at all; it is a skin infection caused by a type of fungus. Ringworm is transmitted by contact with an infected animal’s skin or fur, either directly or from a contaminated object. Children are particularly at risk for infection. To reduce environmental contamination, confine infected dogs to one room until they are free of infection; then thoroughly clean and disinfect the household. Cheyletialla are mites that can live on the skin, and sometimes inside the nasal cavity, of cats, dogs, rabbits and other animals. They are transmissible to people, although people are not their preferred host and they usually will not live on them for long. They can be transmitted through close contact with infected animals, or by direct contact with bedding and other materials. «Are Your Dog’s Allergies Real?